Isn’t it great to give credit where credit is due? I can’t take credit for this absolutely beautiful pie. That goes to my mom and her mom, Grandma Jeanette! Since I was little, every Thanksgiving and Christmas my mom would longingly talk about and try to make a pie from her childhood growing up in upstate New York. Despite following her mother’s recipe, she could never satisfactorily replicate it … until she adapted it this year! Instead of pouring the cream filling into the pie after it was baked, she decided to bake the cream in the pie! She also decreased the number of eggs and added an egg white to the cream filling to make it lighter. By increasing the amount of cream cheese, she made it richer and even more tasty! Since this is a French Apple Cream Pie, take a listen to “Tout Doucement” sung by Blossom Dearie. You’ll love it as much as this marvelously continental pie! Refrigerate 10-inch glass pie baking dish. Put flour and salt in a mixing bowl. Stir. Cut lard into chunks and toss into the flour mixture to coat. 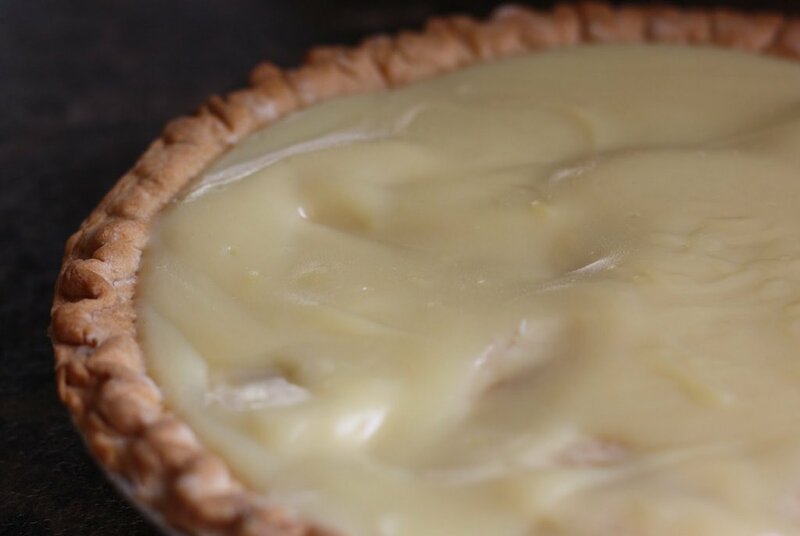 Using a pastry blender, incorporate the lard into the flour mixture until crumbly. Drizzle water over mixture, starting with 3 tablespoons. Stir together with a fork. Add additional water if needed so dough easily presses together when pinched. Leave dough crumbly. Divide dough in half. Form each half into a 5-inch round, flat disc. Wrap one disc in saran wrap and return to the refrigerator. Remove pie baking dish from refrigerator. On a lightly floured surface, roll remaining disc larger than the pie baking dish. Dust rolling pin with flour as needed. Lay crust into pie dish, leaving edges hanging over the lip. Put apples in a large bowl. Sprinkle sugars, flour, nutmeg, cinnamon, cloves, and dried lemon rind zest over apples. Stir to coat apples. Set aside. In a heavy sauce pan, whisk together egg, egg white, sugar and lemon juice. Simmer over medium heat continuously whisking for 2-3 minutes until frothy and thickened. Do not boil. Cut cream cheese into 8 chunks. Adding 2 chunks at a time, whisk into egg mixture until smooth. Add sour cream. Whisk together. Set aside. Remove pie baking dish from refrigerator. Pour apples loosely into crust. Pour cream filling mixture over apples. Nudge apples gently with a spoon to allow cream filling to fill in the gaps. Remove pie dough disc from refrigerator. On a lightly floured surface, roll out larger than the pie baking dish. Dust rolling pin with flour as needed. Cut into ½-inch strips, approximately 20 strips. 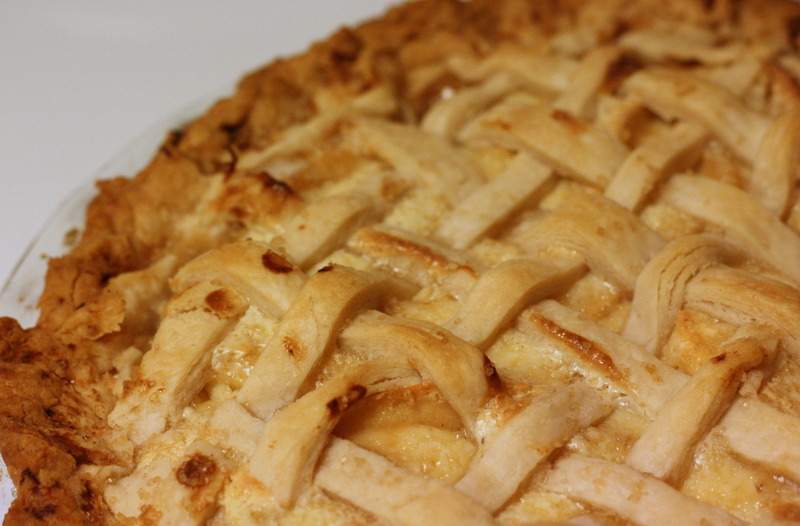 Lay two strips across the pie at 90-degree angles, crossing in the center. Quickly and gently lift and lay remaining lattice pieces under and over each other. Press lattice and pie crust edges hanging over the lip of the pie baking dish together by rolling toward the center of the pie. Crimp the edges by pinching between fingers and thumb going all the way around the pie. Sprinkle coarse sugar over the top of the pie. Bake for 45-55 minutes. The cream filling should be firmly set. Bottom crust and lattice pieces should be golden brown. If edges of pie crust are getting too dark, put foil or a crust guard over the edges about 20 minutes into baking time. Cool slightly before serving. Refrigerate.